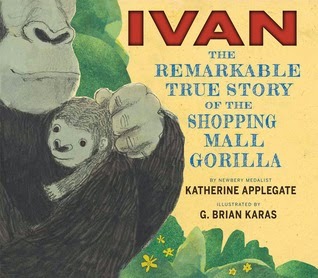 In an accessible, narrative style, Katherine Applegate shares the story of Ivan the Shopping Mall Gorilla with young readers in this nonfiction picture book. Many readers will be familiar with Ivan's heart wrenching story from the Newbery Medal winning book, The One and Only Ivan by Applegate. Ivan: The Remarkable True Story of a Shopping Mall Gorilla traces the story of how a young gorilla was caught by poachers and taken away from his parents and his home in central Africa. Illustrator G. Brian Karas captures the seriousness of the situation with dark, somber illustrations depicting Ivan and another young gorilla inside a crate as they are shipped to the U.S. Karas uses the vast, empty space on another double-page spread as he shows how alone Ivan was when his gorilla companion died. Readers will be surprised and saddened as they read about how Ivan spent twenty-seven years of his life in a cage at the mall. The simple text and cartoon-like illustrations make this serious and poignant story accessible to very young readers, and it's sure to elicit a strong response from children who will see the injustices and cruelty Ivan endured. Readers should take time to explore the back matter that includes a page "About Ivan" and a note from Jodi Carrigan, Ivan's keeper at Zoo Atlanta. Watch the book trailer for Ivan: The Remarkable True Story of a Shopping Mall Gorilla.